We hope you are enjoying the summer. Since our last newsletter, we've provided a lot of tips, news items, and other activity on our web site, blog, and Facebook page. Please Like our Facebook page to receive more timely and detailed information than we can provide in our newsletter. We recently deployed a new support forum which improves the way we mutually communicate and track issues. We hope you like it. In May, I spoke at the Portland Access User Group Conference on Visual Studio LightSwitch and how it compared to Microsoft Access and Visual Studio. Afterwards, my team and I came up with a matrix that summarizes the features and limitations among the platforms. We hope you find it useful to better understand the differences. About two months ago, we migrated our Exchange Server from one cloud host to Microsoft Office365. Microsoft is now hosting our email and SharePoint platform for us. The transition wasn't entirely without hiccups as we experienced a week of emails going to two places, and challenges with how our calendars and recurring meetings were migrated. Now that things have settled down, we are enjoying the benefits of the hosted platform. Last month, I had the pleasure of my annual lobbying on Capitol Hill with the Association for Competitive Technology. About 50 technology leaders from across the country shared our experiences with legislators. We illustrated how technology policy impacts small businesses and jobs when it comes to laws impacting privacy, intellectual property, immigration and STEM education. The reception was very positive and enlightening for all. FMS is pleased to share that our Total Access Analyzer and Total Visual CodeTools are featured on Mark Tabladillo's product recommendation list for 2013. His recommendation list includes products for analytics, big data, and data mining professionals and based on his personal use of them. We're glad you found them valuable and thanks for taking time to provide the endorsements! Learn more about All our Microsoft Related Products. Microsoft Access started at the beginning of the Windows revolution 20+ years ago and became the most popular database of all time. More recently, additional technologies have become significant, so it behooves the Microsoft Access community to be aware of the trends and options. A variety of platforms and options are available with benefits and limitations with each. 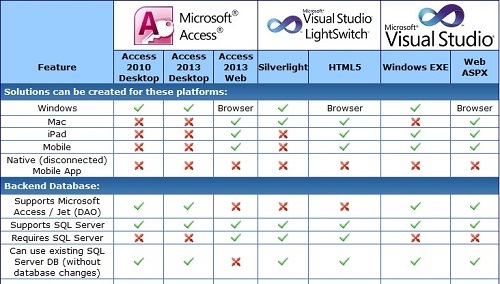 Meanwhile, Microsoft Access is also evolving with their latest Access 2013 version offering new web based solutions. Read our new paper entitled Comparison of Microsoft Access, LightSwitch and Visual Studio Platforms for Database Developers on what we're seeing and experiencing. The FMS Professional Solutions Group was selected to create a multiuser system to collect the inspection results electronically and generate a variety of management reports. Within two months, we deployed our solution which offers data entry screens to replicate a variety of existing forms and many new management reports. An intuitive user interface made it easy for users without requiring extensive training. More importantly, we established a solid database foundation to improve NARA processes both today and into the future. Discover what we learned when we encountered a database that would inconsistently lose its compiled state for some users. The compiler would flag field references to the form's RecordSource as missing fields, but the fields existed. So why was this happening at random times for different users? It was due to programmatically changing the RecordSource of forms, which may not be the form where the compile error is triggered. Ugh! Microsoft Access add-ins and databases should never be installed in the C:\Program Files folder. Learn more about this issue related to User Access Control even if the user has administrative rights. We are very pleased to announce our new technical support site (http://support.fmsinc.com) to provide forums and the ability to submit technical support tickets. Our new site lets you submit requests and respond to them via email with our support team. It also lets you visit our site to check the status of your requests and see the entire chain of communications. You can login directly or use affiliated logins from Facebook, Google, and Twitter. You can also read information and ask questions to the community. We hope you'll join us. We remain ardent users of Microsoft Azure and appreciate Microsoft's continual improvement of their cloud platform. Microsoft recently announced several significant enhancements. First, they lowered prices, the way they calculate usage, and shared licenses on Azure virtual machines (VMs). An automated system is now available to simplify scalability by automatically adjusting the CPUs to respond to usage demand. Previously, if a virtual machine (VM) was turned off, it continued to incur fees unless it was deleted. Now, the billing stops without the hassle of deleting it which makes it much easier to turn testing and development sites on and off. In an amazing sign of their commitment to hosting enterprise solutions, Azure now supports the hosting of Oracle databases in addition to SQL Server! Read more about these and other Azure enhancements. Microsoft recently added to its already huge collection of free eBooks. Topics include Microsoft Office, Office365, Microsoft SharePoint, Windows Azure, Microsoft SQL Server, Microsoft Visual Studio, and Windows, Windows Server, Web Development, and more.